And so it was that the violence in Syria was dominating headlines in the middle of March, 2012, and Syria’s strongest neighbor, Israel, was not doing anything to help calm the situation, or support either side. The internationally acclaimed practice of political non-interference was at play. This, is realpolitik. In response to this form of political idleness, Oy Vey and Laughzilla thought it would make a nice statement to draw an editorial cartoon to point out the hypocrisy of the Israeli government’s policy, given how many thousands of innocent civilians were being slaughtered in their neighboring state. Why not at least send humanitarian aid? Why not Love Thy Neighbor as the good book says. Of course, the answer is, this is politics, and unfortunately for the people of Syria, their country is not blessed with large resources of oil or gas. Who will you always love? So it happens that in the record of history, the American pop star diva was laid to rest at the same time that the President of Syria, Bashar al-Assad, was slaughtering more of his Syrian subjects. Despite the unlikely combination of the two stories, Laughzilla found a way to do just that with this diva / dictator editorial cartoon for the bitter pill webcomic at The Daily Dose in this classic Assad / Houston cartoon. By the way, if you don’t yet own your own copy of The Daily Dose editorial cartoon books, you might want to, with this caveat: The humor kills and the illustrations are to die for. 10. 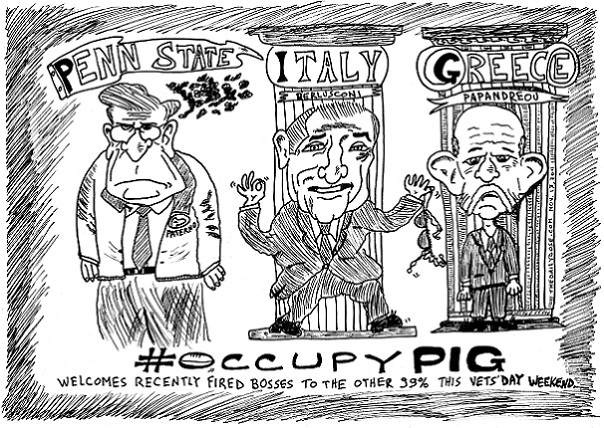 #OccupyFlightCrews – Because the 99% are tired of being flown around by the top 1% of in-flight personnel. 9. #OccupyWings – It’s the best way for pilots to keep the other 99% aboard from rising up. 8. #OccupyCockpits – Because the 99% are tired of the captains of the airline industry getting the best view. 7. 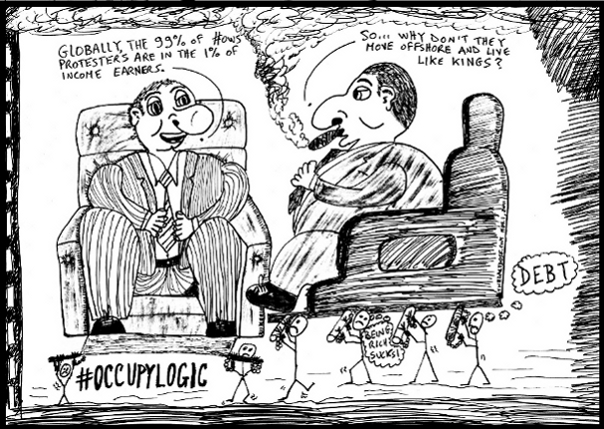 #OccupyPoliticalExtremes – Because little is as boring as compromise and agreeing with your counterpart most of the time. 6. #OccupyAirports – Because the 99% are tired of being groped by the top 1% of TSA Agents. 5. 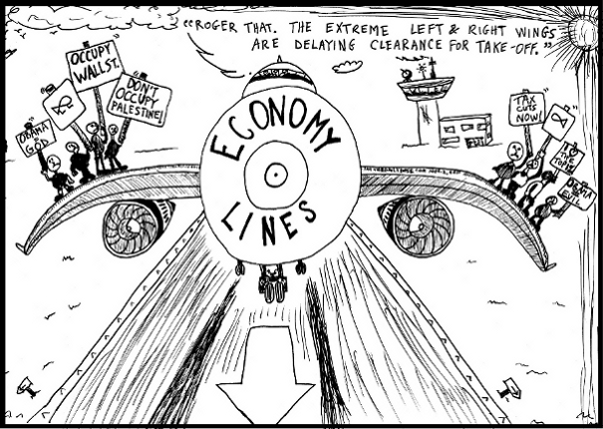 #OccupyRunways – Because the 99% of airplanes are tired of yielding to the top 1% of jumbo jets. 4. #OccupyHandouts – Because there’s no such thing as a free lunch or a cheap first class ticket. 3. 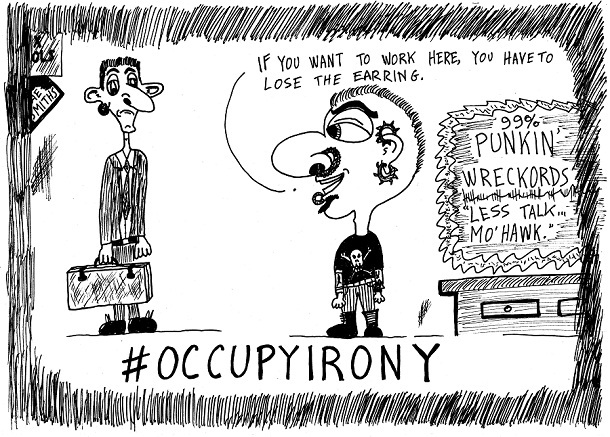 #OccupyEconomyClass – Because it’s cheaper than occupying business class. 2. #OccupyGreed – Even the most well-intentioned Occupy Wall Street protester wants more, and even the noblest of the wealthiest 1% wants to give away less. 1. #OccupyAirSpace – Because up in the air, you’re the sovereign ruler of your own domain. 10. 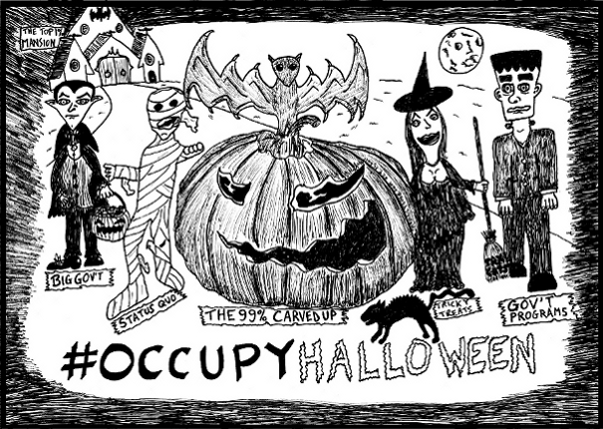 #OccupyPumpkin – Because the 99% are tired of being carved up by the top 1% of the wealthiest pumpkin owners. 9. #OccupySocialMedia – If you want, one neat hi-tech trick is that you can share your treats with your friends. 8. #OccupyTrickOrTreat – Stop at nothing to celebrate pagan culture and higher dental bills. 7. #OccupyVampires – Because the 99% are tired of having their blood and treasure sucked out of them by the top 1% most powerful vampires. 6. #OccupyWerewolves – The lying scheming wheelers and dealers can be so two-faced, it’s like night and day, and it leaves you howlin’ mad. 5. #OccupyZombies – Keeping things the way they are (the rich get richer, the other 99% don’t) is the oldest trick in the book, and it can make you feel like a Zombie living it day to day, everyday. 4. #OccupyFrankensteins – Patch it together anyway you like, the worst government programs are the ones made by man. Full of hope, good intention and ambition, resulting in countless unintended disasters. 3. #OccupyWitches – A Witch’s broom can sweep many things under the rug and fools lots of trick or treaters, but a good government witch can also lift spirits higher with sweeping tax cuts. 2. #OccupyBats – Even when baseball season is over, you can still enjoy bats on Halloween. 1. #OccupyHauntedHouses – The Capitol, The White House, The Supreme Court. Full of ghosts and undead powers that be.